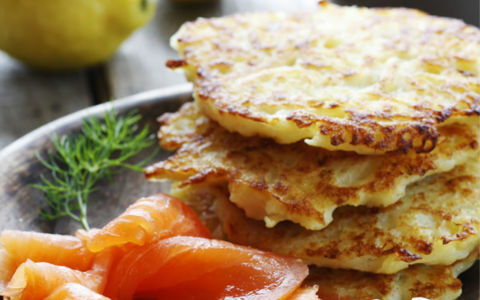 Boxty is a traditional Irish pancake made with a mixture of mashed and grated raw potatoes. Combined with smoked salmon it makes a great brunch or lunch dish. Put both the mashed and grated potatoes in a bowl. Sprinkle over the flour and seasoning and mix until evenly combined. Add the milk, little by little, until you have a dropping consistency. Heat a little oil in a non-stick frying pan over a medium heat. Add a knob of butter. When the butter begins to foam, spoon a tablespoon of the mixture into the frying pan. Cook for a couple of minutes on each side until golden brown. Depending on the size of the pan you can cook two or three at the same time. Remove from the pan and keep warm while you finish cooking the pancakes. Serve with sliced smoked salmon and a spoon of soured cream.